My career as an entomologist began seriously at London University with a study of the biophysics and physiology of hatching and molting in grasshoppers. As a British Government scientist I worked on regulation of feeding in locusts, biology and control of agricultural pests in developing countries, and theoretical questions about insect-plant interactions. Later, as professor at the University of California Berkeley, I broadened my interest into all manner of physiological, behavioral and ecological studies of grasshoppers and caterpillars, in collaboration with colleagues, postdocs and students. I studied learning, phenotypic plasticity, nutrition, causes of mortality in the field, and contrasts between herbivorous insect species that specialize on particular plants and those that are catholic in their tastes. Finally, at the University of Arizona, I used interdisciplinary approaches to understand the evolution of plant-insect interactions, and the tradeoffs involved in different levels of specialization. Among other things, I engaged in the study of chemoreceptors, sequestration of noxious plant chemicals, levels of attentiveness and vigilance in insects with different diet breadths, and evolutionary bases for different feeding strategies. I have been fortunate through my career to have had thirty-eight graduate students and postdocs who have added inspiration, ideas, criticism, and many hours of fun. 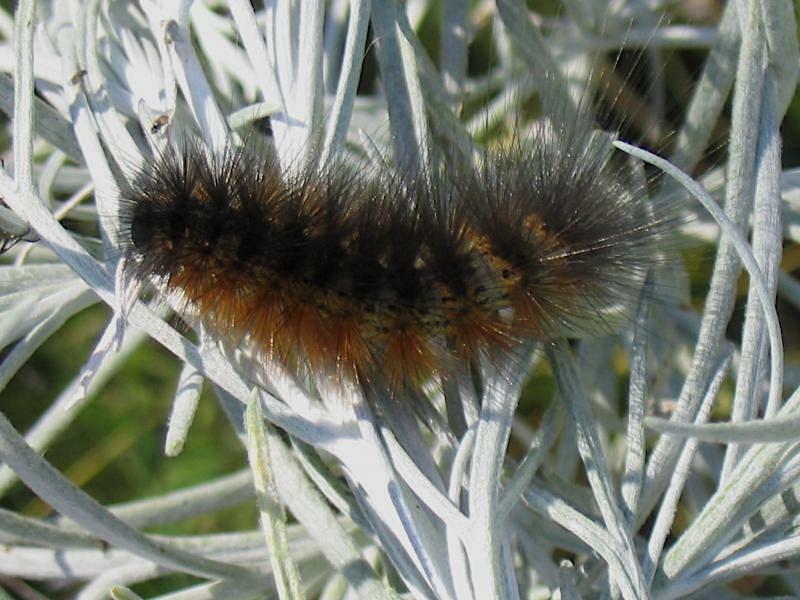 Taste cells of the woolly bear caterpillar (Estigmene acraea) are highly sensitive to alkaloids that they like and sequester to protect themselves from predators and parasites. The displays (below left) show electrical potentials from an alkaloid sensitive cell responding to the alkaloid seneciphylline N-oxide over quarter of a second. Note that the top graph is with no alkaloid, and the second to top graph displays a response to an extremely low concentration, more like the sensitivity of a smell receptor, and those below show responses at increasing concentrations. All concentrations can be found in some of the caterpillar’s food plants. Costs to food generalists in relation to foraging/feeding decisions. 'A' represents a difference in level of accuracy due to constraints on ability to process complex information. 'E' represents a difference in the efficiency (time taken to make a decision) due to constraints on ability to process complex information. Feeding in nature is extremely dangerous compared with resting. 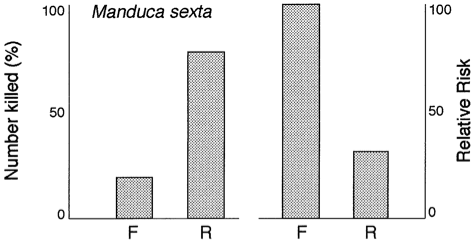 These graphs show that death is 4 times and 100 times more likely during feeding than during resting in two species of caterpillar. Woodhead, S. and Bernays, E.A. 1977 Changes in release rate of cyanide in relation to palatability of sorghum to insects. Nature 270: 235-236. Bernays, E.A. and Woodhead, S. 1982 Plant phenols utilized as nutrients by a phytophagous insect. Science 216: 201-203. Bernays, E.A. 1986 Diet-induced head allometry among foliage-chewing insects and its importance for graminivores. Science 231: 495-497. Bernays, E. A. and Graham, M. 1988 On the evolution of host specificity in phytophagous arthropods. Ecology. 69: 886-892. Bernays, E.A. and Janzen, D. 1988 Saturniid and sphingid caterpillars: two ways to eat leaves. Ecology. 69: 1153-1160. Bernays, E.A. 1989 Host range in phytophagous insects: The potential role of generalist predators. Evolutionary Ecology. 3: 299-311. Bernays, E.A., Bright, K., Howard J.J., Raubenheimer, D. and Champagne, D. 1992 Variety is the spice of life: frequent switching between foods in the polyphagous grasshopper, Taeniopoda eques. Animal Behaviour 44: 721-731. Bernays, E.A. 1998. The value of being a resource specialist: behavioral support for a neural hypothesis. American Naturalist 151: 451-464. Bernays, E.A. and Funk, D. 1999 Specialists make faster decisions than generalists: experiments with aphids. Proceedings of the Royal Society of London B 266: 151-156. Bernays, E.A., Chapman, R.F. and Singer, M.S. 2000 Sensitivity to chemically diverse phagostimulants in a single gustatory neuron of a polyphagous caterpillar. Journal of Comparative Physiology 186: 13-19. Bernays, E.A., Chapman, R.F. & Hartmann, T. 2002 A taste receptor cell dedicated to the perception of pyrrolizidine alkaloids in two species of polyphagous arctiids. Physiological Entomology 27:312-321. Bernays E.A. and Singer, M.S. 2005. Taste alteration and endoparasites. Nature 436, 476. M S Singer, Kevi Mace and Elizabeth Bernays. 2009 Self-medication as adaptive Plasticity: Increased Ingestion of Plant Toxins by Parasitized Caterpillars. PLoS ONE Volume 4 Issue 3 Article Number e 4796. Carolina E. Reisenman, Jeffrey A. Riffell, Elizabeth Bernays, John G. Hildebrand. 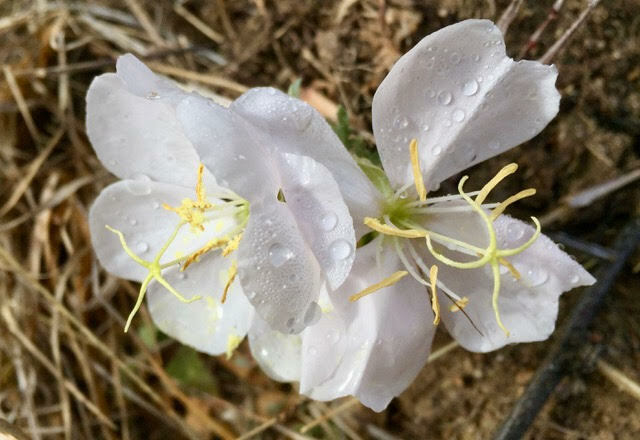 2010 Antagonistic effects of floral scent in an insect-plant interaction. Proceedings of the Royal Society of London 1692, 2371-2379. Bernays, E.A. 1983 Nitrogen in defense against insects, in: Nitrogen As An Ecological Factor. Eds. J.A. Lee, S. McNeill and I.H. Rorison. Blackwells, Oxford. Bernays, E.A. 1985 Regulation of feeding behavior, In: Comprehensive Insect Pharmacology, Biochemistry and Physiology. Vol. 4 Eds. G.A. Kerkut and L.I. Gilbert, Pergamon Press. Bernays, E.A. and Chapman, R.F. 1987 Evolution of Deterrent Responses in Plant-Feeding Insects. In: Topics in Feeding Behavior and Physiology, Eds. R.F. Chapman, E.A. Bernays, and J.G. Stoffolano. Springer-Verlag. Bernays, E.A. and Simpson, S.J. 1990 Nutrition. In: Biology of Grasshoppers, Eds. R. F. Chapman and A. Joern, Wiley and Son. Montllor, C.B. and Bernays, E.A. 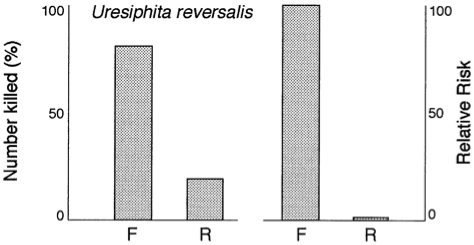 1992 Invertebrate predators: how they constrain caterpillar feeding strategies. In: Caterpillars: Ecological and Evolutionary Constraints on Foraging, Eds. N.E. Stamp and T.M. Casey Chapman and Hall, NY. Bernays, E.A. 1992 Aversion learning and feeding. 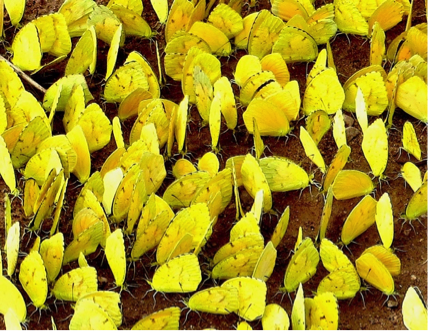 In: Insect Learning: Ecological and Evolutionary Perspectives. Eds. A.C. Lewis and D.R. Papaj, Chapman and Hall, New York. Bernays, E.A. 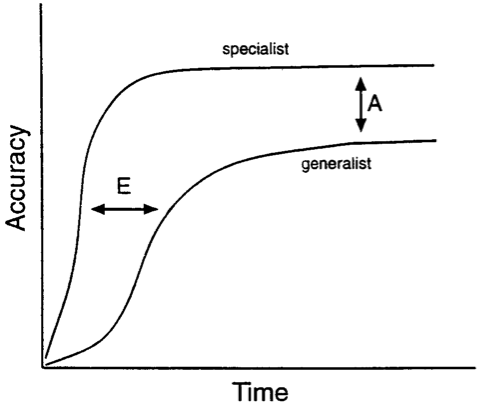 1995 Effects of experience in host-plant selection. In: Chemical Ecology, Eds. R.Carde and W.Bell, Chapman and Hall, New York. Bernays, E.A. 1998 Evolution of feeding behavior in insect herbivores. BioScience 48. Bernays, E.A. 2001 Neural limitations of phytophagous Insects: implications for diet breadth and host affiliation. Annual Review of Entomology 46.